Started this discussion. Last reply by Cheryl Kaye Tardif Sep 29, 2008. I am a full-time mystery/suspense author with various published books, including my bestselling novel Whale Song, which is being used in many schools in North America and overseas. I've also branched off into romance as romantic suspense author "Cherish D'Angelo". 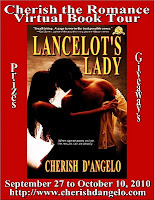 My debut contemporary romantic suspense is titled Lancelot's Lady. It was a semi-finalist in the Dorchester Publishing "Next Best Celler" contest and it won an Editor's Choice Award from Textnovel. I have 2 thrillers completed: Children of the Fog and Divine Justice. They're in the hands of my agent Jack Scovil. I was a journalist as a teen, and wrote short stories and poetry as well. But fiction always was and remains my true passion. Every character, every world I create comes alive for me. From now until July 30th, 2009, you can submit a name (first & last) of someone you know (boss, husband, school bully, ex-friend or yourself), or a fictitious name. I am looking for a male name, suitable for a 50-ish cigar-smoking man. I can't do this without you. To become a top finalist I NEED YOUR VOTES. Authors, are you looking for bookplates you can autograph and mail to readers? Yes we can talk to each other. You can never have enough Cheryls! Cheryl, it's a pleasure to meet you here! Yes I am reading it and would love to get a review in for you. Thanks again. I opened my email and saw an email from you when I went to open, it vanished!! So I am here wishing you the best and I will be talking to you again real soon.